Amazon’s display ads with e-commerce creative automatically optimize creatives to meet a campaign’s goal. The type of e-commerce creative served will be based on Amazon’s machine learning algorithm and a selected optimization goal such as click-through rate, purchase rate, or detail page view rate. 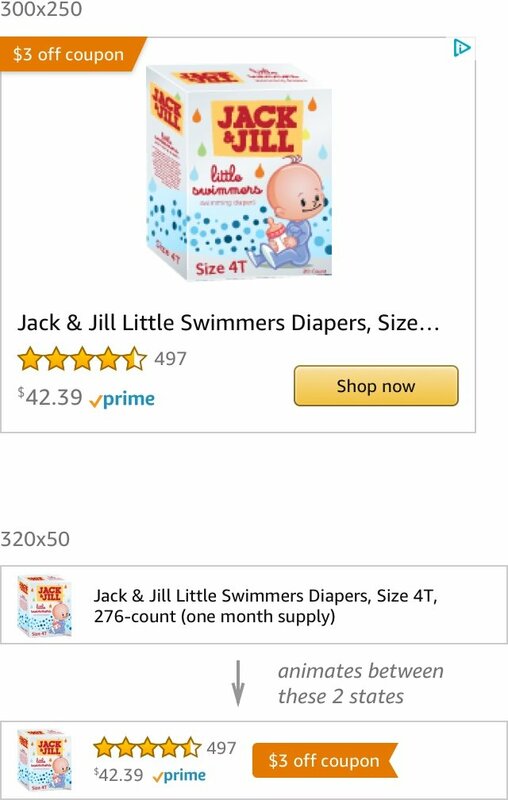 The creative can include a custom designed image, or an image which is created automatically using the product image found on the Amazon detail page. Amazon optimizes between various creative elements to drive the best performance for your e-commerce creative and the end customer. 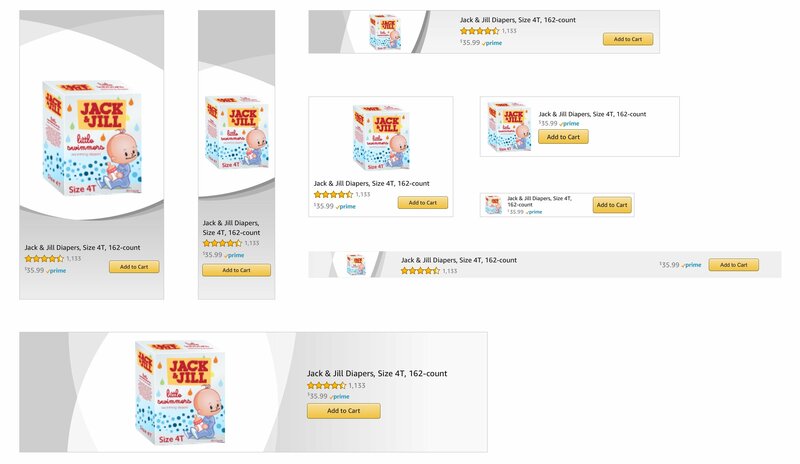 At times, Amazon may test variations of the e-commerce elements, copy, layout and design. The illustrations below show the standard formats, and are not an exact representation of what your ad may look like. Available in the following 300x250, 160x600, and 300x600 ad placements: Homepage Above the Fold (ATF), Homepage Below the Fold (BTF), Search Skyscraper, Read All Reviews (RAR), Detail Page, and Thank You Page. Available in the following 970x250 and 980x55 ad placements for product image only: Homepage Below the Fold (BTF), Detail Page Below the Fold (BTF), Deals Page (ATF), Offer Listings Page (ATF). Available in all 320x50, 414x125, and 300x250 placements on Amazon mobile web for smartphones. Available in all 320x50, 414x125, and 300x250 placements except the search page on the Amazon Mobile Shopping app for smartphones. 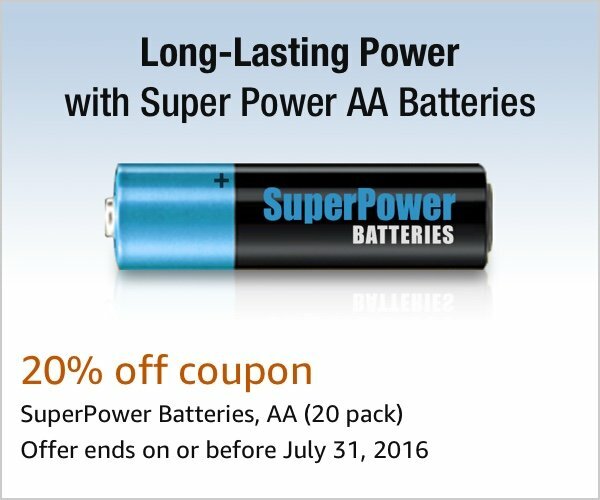 Available in all Amazon Advertising Platform display ad placements for 300x250, 160x600, 300x600, and 728x90 sizes. Available for 970x250 (product image only). Available for 320x50 and 300x250 sizes on mobile web and mobile smartphones. 728x90 size is supported for mobile web on tablets. The main content area and product title are clickable; on click the customer is taken to the relevant product detail page. The product shown in the image must correspond to the product on the detail page where the ad will link to. Self service advertisers can include one Amazon Standard Item Number (ASIN) in an e-commerce creative. Managed service advertisers may include up to 5 ASINs in an e-commerce creative. Amazon Fresh, Pantry, Prime Now, and Prime Exclusive Deals products are not currently supported. Lightning Deals, Deals of the Day, and Best Deals (Savings & Sales) are supported on the Shop Now variation when product image is shown, see below. 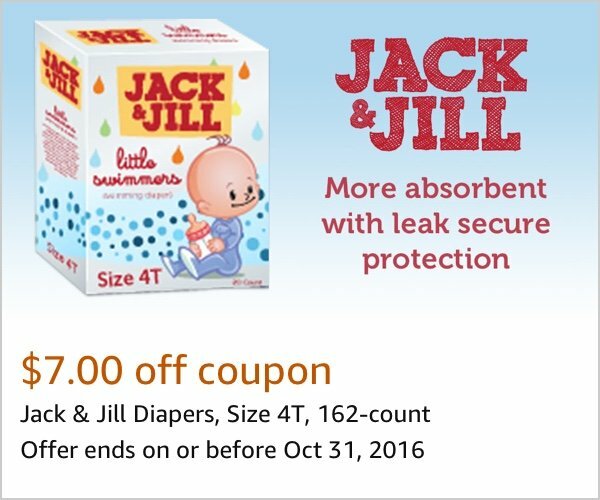 Subscribe & Save coupons are not currently supported. 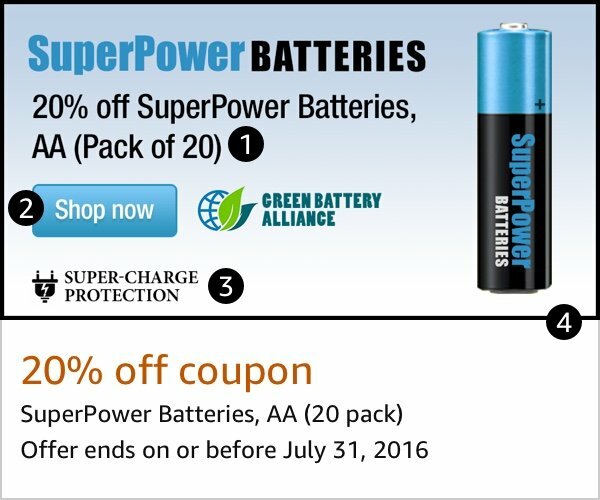 Coupon and Subscribe & Save badging are supported on the Shop Now variation when product image is shown. In the case where the ASIN has multiple discounts, the highest available discount will be shown, see below. For rules, restrictions, and click-through behavior on each e-commerce creative type available as part of an e-commerce creative, see below. The custom image section is separate from the e-commerce section and cannot overlap. Designers may create an image which fades to white to give the creative a more integrated look. The e-commerce section contains information relating to the product such as coupons, star rating, and live pricing. 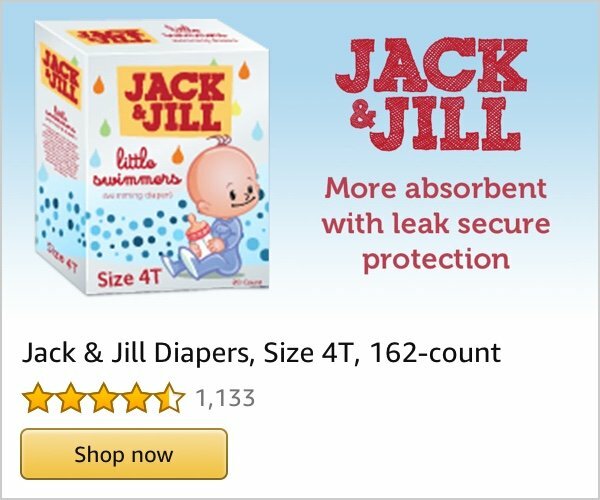 It is created by Amazon based on the product being promoted. It has a white background and sits below, or to the right, of the custom image depending on ad size. 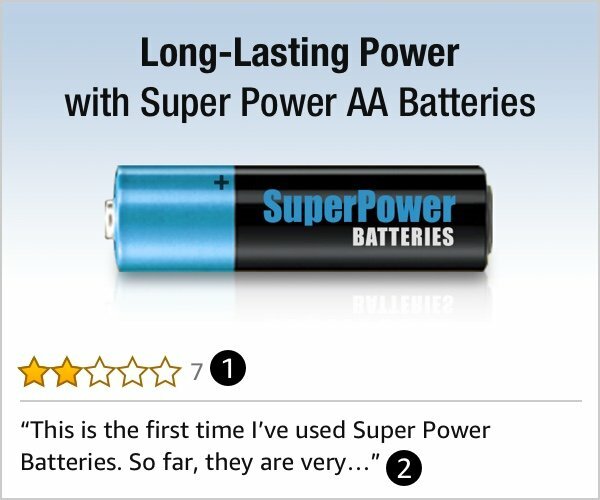 In desktop ads, the Amazon star rating and total reviews number are clickable, leading to the read all reviews page for the relevant product. 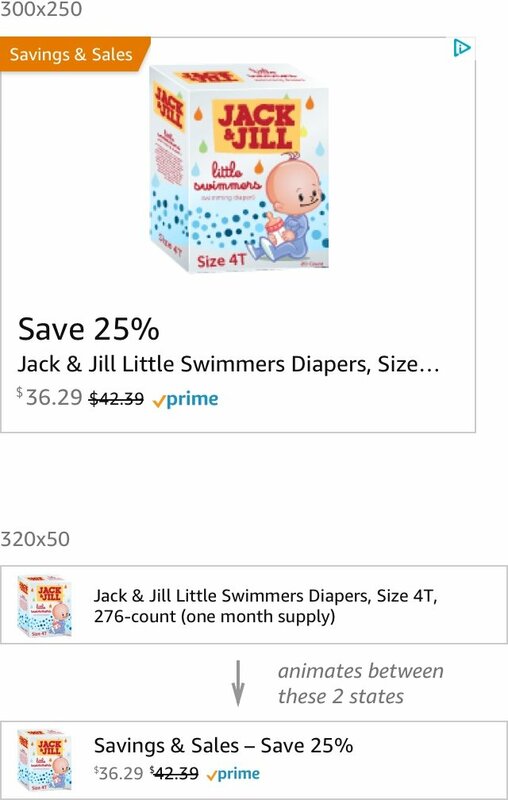 Clicking the “Add to Cart” button adds the product to the customer’s Cart. Clicking the “Pre-order” button adds the product to the customer’s Cart. If the customer is signed in: Clicking anywhere on the ad will clip the coupon and take the customer to the product detail page for that item. If the customer is not signed in: Clicking anywhere on the ad will take them to the coupon landing page where the customer is instructed to sign in. 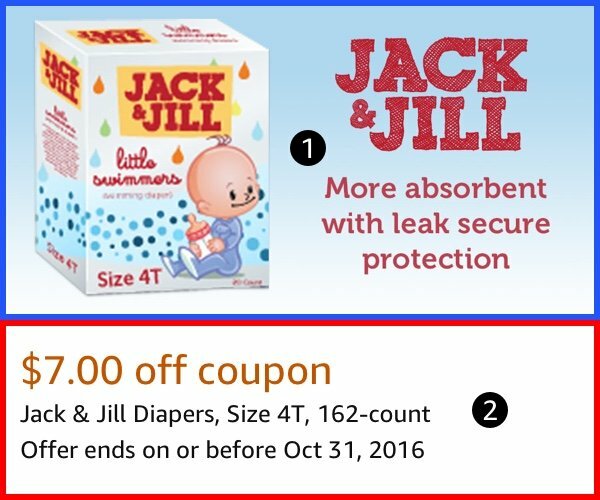 After signing in, the coupon is clipped and the customer is taken to the product detail page for that item. Coupons ads are not currently available for Italy and Spain. 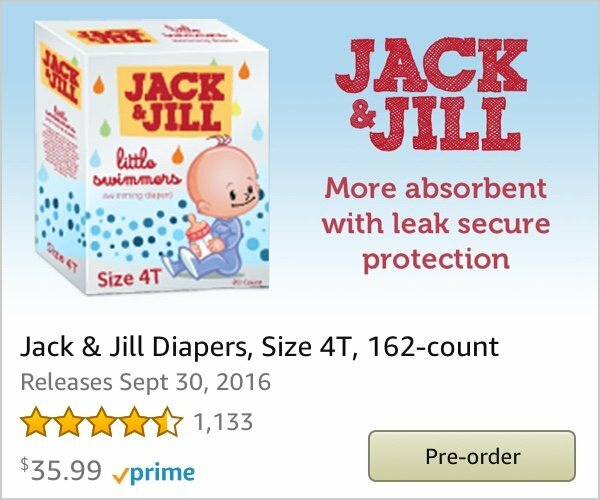 To be eligible, products must have an Amazon star rating of at least 3.5 and a minimum of 15 customer reviews. Review text shown in the ad can be up to 116 characters max. (92 characters max for Vine reviews). The review in the ad must be for the specific Amazon Standard Item Number (ASIN) advertised and located within the Read All Reviews section for that ASIN. For example, if the ad promotes a 25-inch TV, the review cannot be for a 52-inch TV, even if it’s from the same product family. The review cannot compare the advertised product to a competing product or refer to brands other than those being advertised. The review text shown in the ad may not contain emojis. You may not correct a review’s spelling or grammar and should avoid using a review with egregious errors. 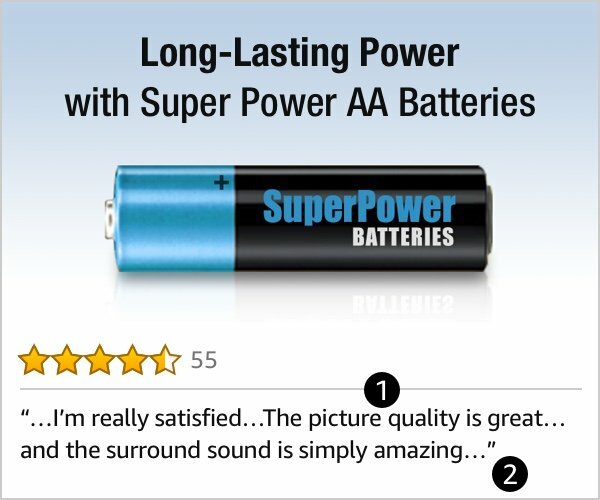 You may not use a customer review with text written in all caps (aside from an individual word or product name). You may not use ellipses to cut off a sentence mid-phrase. The review text should form a complete statement. You may use a maximum of three ellipses to omit portions of the customer review text: one at the start of the review, one in the middle, and one at the end. You may not use ellipses to change the original meaning of the review, for example, by hand picking positive portions of a review that’s negative overall. Clicking the “Shop now” button will take the customer to the relevant product detail page. Available for e-commerce creatives featuring the product image. If an ASIN qualifies for a Lightning Deal: An orange badge or headline indicating the deal type, and copy indicating the deal price and discount are automatically shown in the creative when the deal is live. If an ASIN qualifies for a Deal of the Day: An orange badge or headline indicating the deal type, and copy indicating the deal price and discount are automatically shown in the creative when the deal is live. If an ASIN qualifies for a Best Deal: An orange badge or headline indicating the deal type, and copy indicating the deal price and discount are automatically shown in the creative when the deal is live. An orange badge indicating the percent or dollar amount off is featured in the creative. An orange badge indicating the percent off is featured in the creative. The Subscribe & Save price is shown next to the non-Subscribe & Save price and the non-Subscribe & Save price has a strikethrough. The text “Subscribe & Save” is shown near the prices. Advertisers running e-commerce creatives featuring the product image have the option of including their brand logo and a custom headline within the creative. On most ad sizes, the headline and logo are shown alongside the product image. For 300x250 mobile, the creative animates between the headline/logo and the product image. For 320x50 and 414x125 mobile, Headline is not shown. The creative animates between the brand logo and product image. Maximum of 50 characters in the headline. Don’t include information about an item’s price, as that may change during the campaign. Don’t use unsupported claims. For example, phrases like “best”, “top selling” or “healthiest” are unsubstantiated and will not be approved. 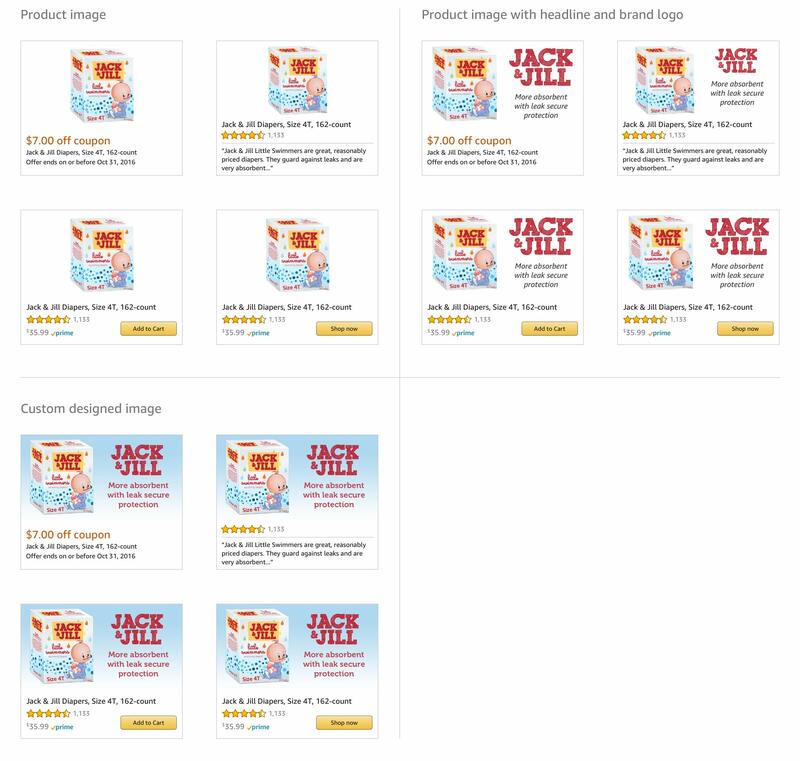 If the promoted product becomes Out of Stock, the Add to Cart variation will not be served. The price and Prime logo will be hidden in the Shop now variation. If a coupon becomes inactive or reaches its’ budget limit, the coupon creative is removed from the optimization. The AdChoices Logo is added to the top left corner of the ad and the location cannot be modified. 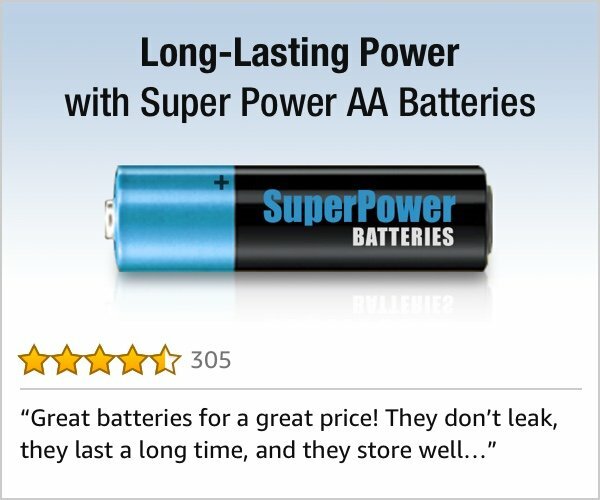 For customer review, the copy “Amazon.com customer reviews” is added. There are some regional differences in how information is displayed within the e-commerce section. Europe and Japan include a “Details & delivery” link in the Add to Cart creative. This link goes to the product detail page. Germany adds “includes tax” or “inkl. MwSt.” for creatives that include the price. Germany includes the price per unit for qualifying products. Europe and Japan do not include the expiration date for coupon creative. Display ads with e-commerce creative include animation on some sizes and placements when a custom image is being used*. 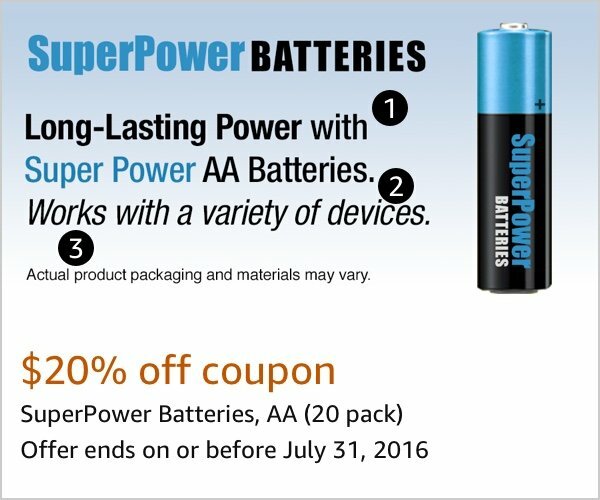 This includes 300x250, 414x125, and 320x50 on the Amazon mobile shopping app and mobile website for smartphones. In addition, this animation may occur on 320x50 ads running on third party sites or apps. 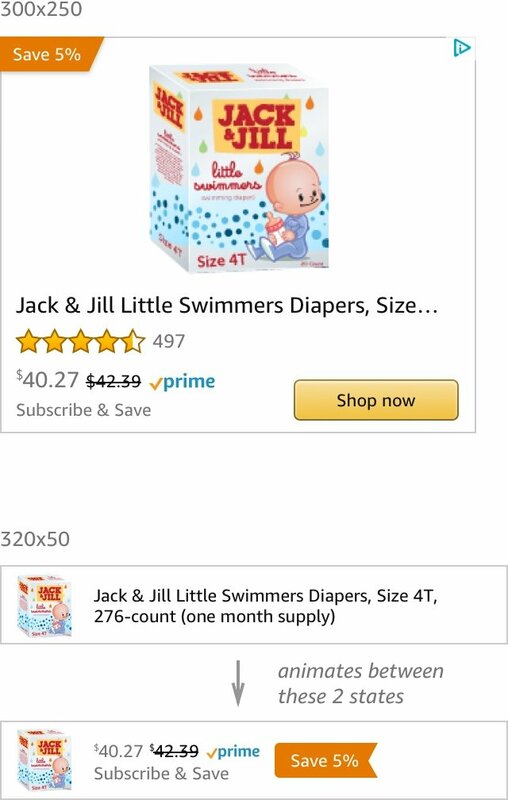 If the ad is in the bottom portion of the phone screen, the product image from the product detail page is shown. When the user scrolls and the ad moves to the top portion of the phone screen, the product image animates out and is replaced by the custom image. 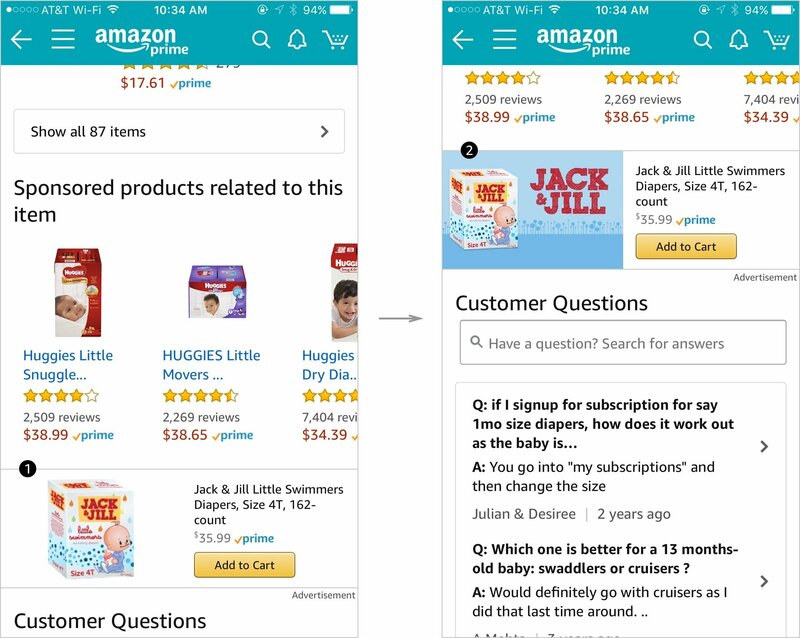 *Amazon sometimes tests animation across different sizes, design elements, and ad formats, in order to drive optimal performance for e-commerce creatives. 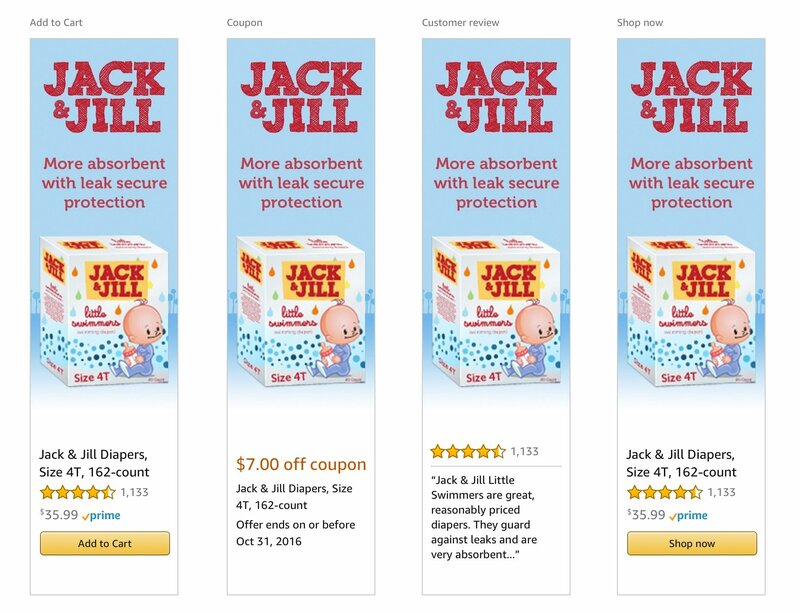 Display ads with e-commerce creative automatically incorporate the product image from the Amazon detail page. However, it is also possible to create your own custom image which can include advertiser branded fonts, logos, colors, and imagery. 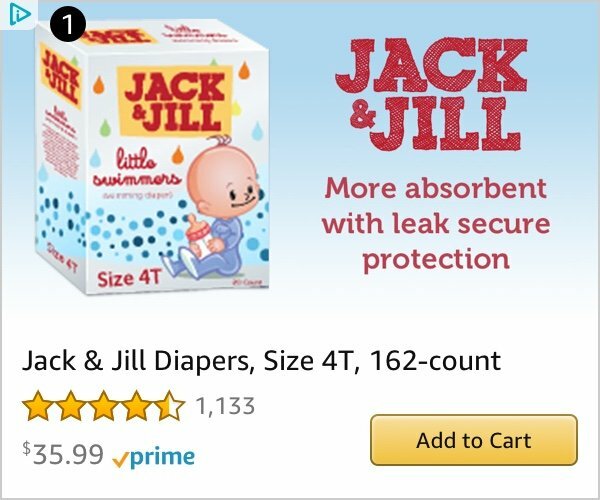 This replaces the product image that is shown by default. When creating the custom images, designers must use these custom image PSD templates. 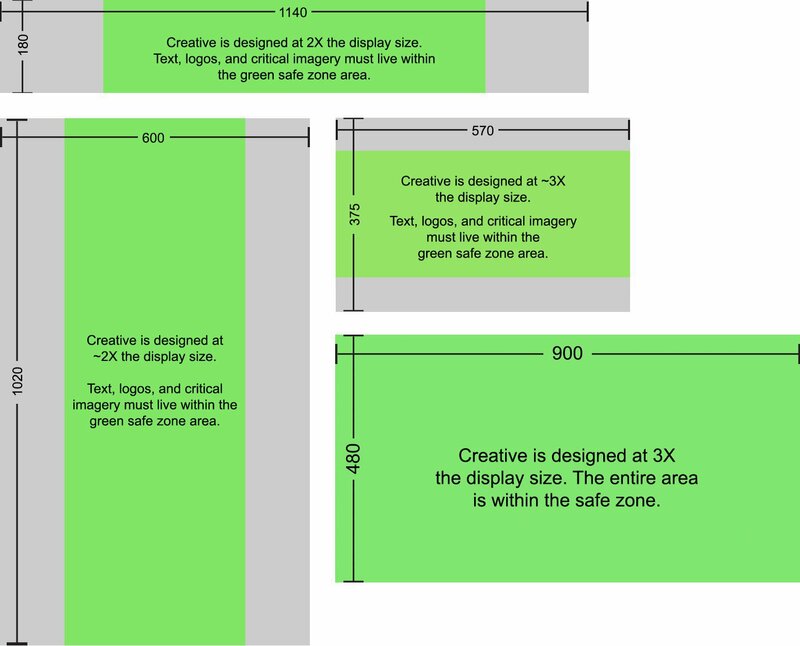 The PSD templates include green “safe zones” where key content such as logos, text, and critical imagery must be placed. Content outside of the safe zones will be cropped off on some ad sizes. Custom images are built at larger pixel dimensions than the final size that is rendered when the ad goes live. This allows the same assets to be shared across desktop, mobile, and high-pixel density desktop displays. 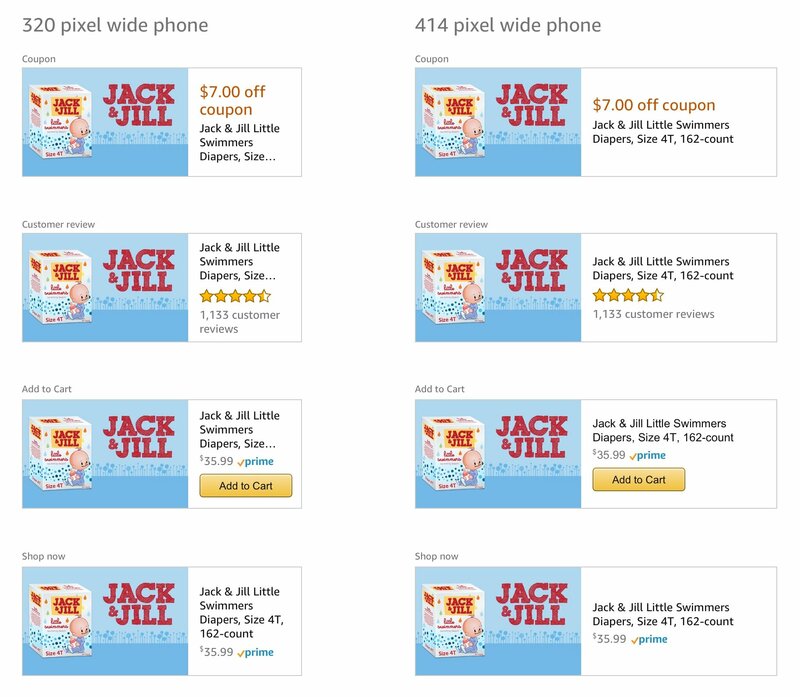 Amazon’s ad platform will crop and scale the custom image based on the desired ad size and device. All text, including text within logos, must be clearly legible. Total words in the custom image may not exceed 10 words (40 characters in JP). Disclaimer copy and text within the logo does not count toward the overall word/character limit. No more than 2 type variations may be used, including font size, color, and style. The 2 type variations minimum does not include type within logos. No more than 2 logos may be used. Legally required marks, like ESRB ratings, do not count towards this overall number. Text within the custom image requires specific min/max font sizes, see below. Disclaimer text must be written in sentence case. Call to Action (CTA) buttons or text are not allowed in the custom image. e-commerce creatives contain their own CTA buttons when required (Add to Cart, Add to List). The custom image should not duplicate information already shown in the e-commerce section. It is strongly recommended to use sentence case for copy within the custom image. Total words in the custom image may not exceed 10 words. Disclaimer copy and text within the logo does not count toward the overall word/character limit. No more than two type variations may be used, including font size, color, and style. Disclaimer copy does not meet the minimum font sizes. 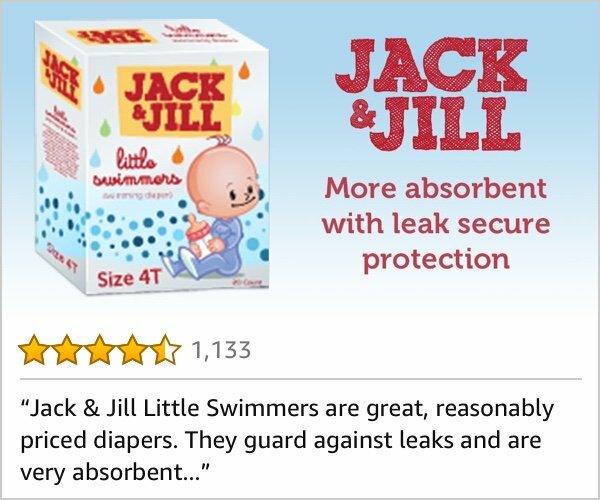 Products must have an Amazon star rating of at least 3.5 and a minimum of 15 customer reviews. No more than two logos may be used. Legally required marks, like ESRB ratings, do not count towards this overall number. Do not include a border. Borders are added automatically as part of the ad unit. The review in the ad must be for the specific Amazon Standard Item Number (ASIN) advertised and located within the Read All Reviews section for that ASIN. Site served. Amazon video ads are not available in off-site placements.